Stunning, Design-Inspired Loft At Glas Condominiums! Chic Downtown Loft In A Gorgeous Boutique Building With A Fantastic Split Plan Layout That Is Just Perfect For Entertaining. 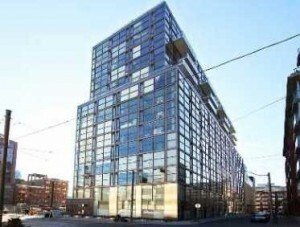 10 Foot Exposed Concrete Ceilings & Walls, Floor To Ceiling Windows And Brand New Wide Plank Engineered Hardwood Floors. Spacious, Open Concept Kitchen With High Polish Cabinetry, Centre Island, Stainless Steel, Caesarstone Counters & Gas Stove For Those Who Love To Cook! Walk Out To The Largest Balcony In The Building – 230 Sq Ft W/ Natural Gas Bbq Hookup! Master Bedroom W/Spa-Inspired Ensuite, Custom Blinds, Surround Sound Cabling, NYC Style Parking Garage Elevator!